Cladded uprights provide strength and stability. Slim profile shelves and frames to minimise wasted space. 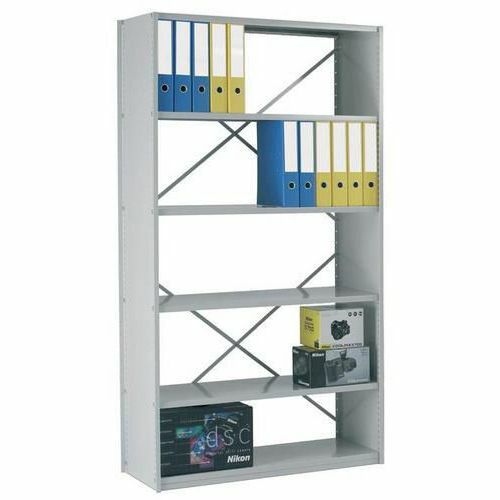 Clear access shelving with no obstructions, for easy removal and return of contents. Components are finished in hard-wearing grey paint RAL7035. 25mm increments allow shelves to be adjusted easily. Supplied flat-packed with all necessary fixings and assembly instructions for easy self-assembly. Single skin steel shelving with clad uprights. Strong yet affordable shelving. Open or steel clad back. Box Content: 2 x cladded upright frames. 6 x steel shelves. Cross-bracing. Cladding for rear included with steel clad back shelving. Fixings and assembly instructions.